You know that feeling when you’re working on something and you’re like 75% sure it’s not going to turn out well for one reason or another? That’s how I felt about this One Pot Roasted Red Pepper and Sausage Alfredo. I should have been more confident, I guess, since the One Pot Spicy Chicken Riggies I made a few months back turned out to be better than I ever could have imagined, but I still can’t get over the fact that you can cook pasta and meat and a sauce all together in one pot and make it taste good. Anyway, I had no idea where I was going with this meal when I started making it. I just kept turning to James as I pulled ingredients out of the fridge and asking him if I should throw them in. I also kept saying to myself, “I really hope this works,” and humming nervously, but that’s pretty typical kitchen behavior for me. By the way, does anyone else do that? Hum nervously? James brought up the other day that I hum the theme song from Doug whenever I’m nervous, and at first I was like, “PSH, I do not!” but then I realized that I do. I totally do, and I have no idea why. So there I was, humming and hovering over my pot of pasta, wringing my hands and waiting for disaster, but that disaster never came. Instead, I got a pot full of some of the tastiest pasta I’ve ever had. 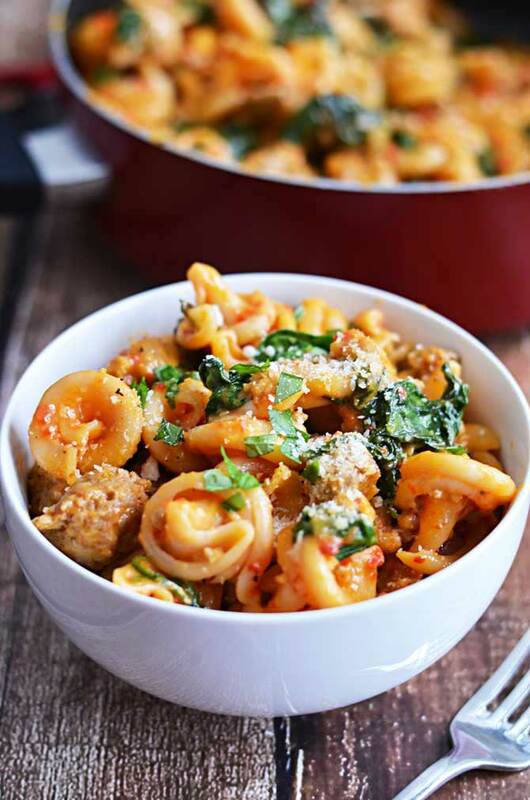 Roasted red peppers, Italian sausage, spinach, goat cheese, and garlic flavor this simple dish, and leave you with a hearty meal that’s as satisfying as realizing you only have one pot to wash after dinner. 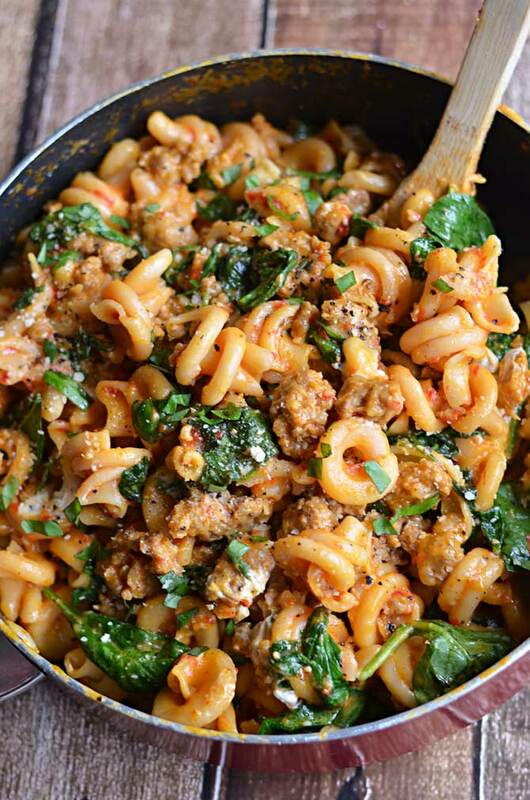 Give One Pot Roasted Red Pepper and Sausage Alfredo a try, and I bet it’ll make its way into your weekly rotation! Remove the casing from the sausage and discard the casing. To do this, simply cut along the side of the sausage with a sharp knife and peel off the pierced casing with your fingers. Stir in chicken broth, pureed roasted red pepper, milk and pasta. Season with salt and pepper, to taste. Bring to a boil; cover, reduce heat and simmer until pasta is cooked through, about 12 minutes. If the liquid has all been absorbed, add the additional milk and chicken broth. Stir in the goat cheese and parmesan. Continue to stir until melted. Remove from heat and serve. Feel free to substitute poultry-based sausages in here. They work well, too! 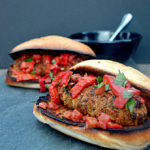 This looks DELICIOUS and sooo easy. Definitely going to try this week! i made this tonight. While the taste was good (I added Cajun seasoning and half as much goat cheese as suggested) it came out very sticky and I completely destroyed the bottom of my pot (totally burned, stuck-on pasta). Definitely need to keep an eye on this one and stir CONSTANTLY. Looks Delicious!!! What type of pasta did you use? This is Girelle that I found at Wegmans. I had never heard of it before then but I really liked it. The sauce clung to it well and it cooked nicely for the one pot method. Not to mention it looks a lot different, which is cool. It is also sometimes called Vesuvio. And thank you! I made this w gluten free pasta and it works just fine!! On my way to Wegmans now to make it again! Well, let me tell you it can’t be nothing but God because I just so happened to have all ingredients in my kitchen and I made it for dinner tonight and boy was it DELICIOUS!!!!!!!!! THIS is definitely a keeper and nice for company too! Make this guys! I’m so happy to hear it, Tanya! Absolutely loved this! Thanks for being so creative! Can i toss frozen tortellini in or should i cook the pasta first?? I’ve never tried using tortellini. I’m sure the cook time would increase for frozen, but it should work. Let me know how it goes if you decide to give it a try. What alternative to goat cheese would you recommend? You could try ricotta or any creamy-textured cheese instead. It will change the taste but it should work fine. This was delicious, thanks for the recipe! 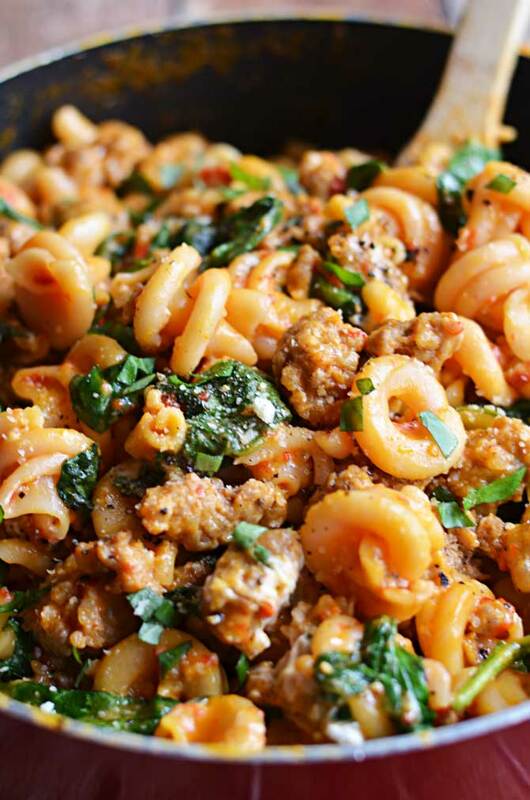 I used spicy Italian sausage to give it a bit of a kick. Glad you liked it, Katherine! This looks delicious…May share it on my blog! From the 15-year-old son, “Wow. This is really good, Mom!” Husband, “This tastes like a restaurant dish!” Hands down the most delicious thing I’ve made or eaten that wasn’t served for dessert. Thank so much. You are amazing. This recipe looks amazing but I cannot view it on my mobile phone. Despite trying everything it disappears and only the comments appear. That’s strange… I’ll look into that, Carrie! Thanks! just made this an it is awesome smells so good in the kitchen right now thank you for the recipe will make this again!!!!! =) Happy to hear it, Mitzi! I’ve used hot too! It’s great if you like a lot of spice! =) Glad you enjoyed it, Josie! I just came across this post from Pinterest and wanted you to know you’re not alone–from time to time, I also find myself humming the theme song to Doug 🙂 I didn’t even watch it much when it was on! YES! I can’t wait to tell James. Thank you for that, haha! Glad you liked it, Whitney, and thanks for the feedback. So this looks amazing! I want to make it for my little guys though..what’s the spice like? Am thinking of perhaps halving the amount of garlic…thoughts? I personally don’t find it very spicy at all, but if you’re worried, cutting down the garlic will be fine. Make sure you’re using a very mild or sweet sausage, though, as anything spicier will really kick up the heat in the whole dish. Hope you all enjoy it! Awesome recipe. Instead of fresh spinach, I used a box of chopped spinach that I found in the freezer. Probably more than the recipe called for but it worked. More greens, less expensive and no waste? Works for me. But the leftover pasta tends to soak up too much of the sauce and gets mushy. So today, tried to make the sauce separately. Huge fail on my part. I’m sorry to hear that your “lazy sauce” didn’t turn out! I can completely relate– I often try to substitute things I have at home instead of running to the store. Unfortunately, it also often doesn’t work as I would hope. However, sometimes you wind up with something great! Bill Gates once said, “I choose a lazy person to do a hard job. Because a lazy person will find an easy way to do it.” It’s so true. Us lazy people are great at finding shortcuts and coming up with new solutions for things– hopefully the next time you have the weekend lazies, it works in your favor!! Hmm, it’s Wednesday and I think it’s time for a healthy red pepper vitamin C pumped recipe! Wow! This dish was awesome 🙂 My super-picky son ate THREE plates of it! So glad to hear it, Leslie!! This was unbelievably good!!!! So good and so easy. I made this tonight for dinner. Amazing! Thank you so much for sharing. Looks amazing! I shared your recipe in my weekly meal plan and Real Food Recipe Link Up! I know you said any pasta would work but wondered if you would recommend using a cheese filled tortellini? 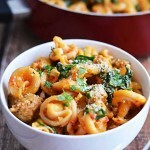 I’ve never tried using tortellini for this, but I don’t see why it wouldn’t work! I agree with the other comment about the goat cheese being waaaaay to much. I couldn’t really taste any of the roasted red peppers because the goat cheese was so very overwhelming. I used spicy Italian sausage, so that saved the dish. Otherwise, the only flavor would have been GOAT CHEESE. Maybe it’s just the brand I used? Oh. My. GOSH! My fiance is in California for the next three months and I vowed not to let myself eat chicken breasts and steamed broccoli every night just because they are easy and I’m only cooking for one. This recipe is absolutely incredible. I want to shout it from the rooftops! 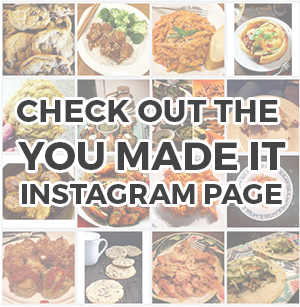 In fact, I think all of my meals this week I found on your blog. Thank you, thank you, THANK YOU!! Do you have to slice the sausage prior to browning??? How did you prepare it? I have the hardest time getting sauce to thicken! I’ve attempted about 5 different recipes and every time my sauce ends up a soupy, runny mess. I boiled and simmered according to the recipe and honestly don’t know what I’ve done wrong. Any advice? Hi Lynn, I’d assume that what you are describing as a simmer is a lower temperature than what the recipes are asking for? Or perhaps you are overly generous with the liquid ingredients (for example, with this recipe, were you sure to drain the roasted red pepper jar before blending)? Aside from that I really can’t imagine what a consistent issue with sauces could be. However, with any recipe, if you find that your sauces are too thin, try mixing in a cornstarch slurry and that will thicken it up for you!! I found that my sauce failures were due to using skim milk. It’s too thin to make a good sauce or gravy. Kicked it up to 2% and it solved the problem. Hope this helps. Dumb question: when you say 12 oz of pasta, is that by volume (1 1/2 cups of pasta) or is that by weight? 12 oz by weight, not a dumb question! Hello, making this now with Tofurkey sausage and reducing the portion of goat cheese. It smells great so far! Question about using 12 ounces of pasta- I have only been able to find 16 oz boxes of pasta. How do you measure out 12 ounces? Are you eye-balling it? My friend shared this recipe on Pinterest and said I have to try it! I can’t wait to make it and see how it tastes! I feel like the noodles didn’t cook properly according to this recipe. The came out sticky. I wonder if I cooked on high after.adding noodles instead of simmering would fix this…..
Love this dish! Thanks for the recipe….do you think this can be frozen for future meals? This turned out absolutely amazing! My husband loved this dish and was absolutely stoked on it. I only made two changes to the recipe. I used a whole pound of sausage because I couldn’t have just one sausage hanging around, I added red pepper flakes, and I only used 4oz of goat cheese. The recipe still turned out amazing with only half of the goat cheese, however, I would like to try it with the full 8oz sometime. This happened by silly accident on my part of only including “goat cheese” and no amount on my shopping list, but it did no harm to the dish! Thanks for posting such a wonderful recipe! I’m so glad to hear it, Kelly! You’ve done it again, Morgan! This was so great and not something I will get sick of eating all week for lunches. Please never stop with this blog! Thinking this will be dinner tonight, but I don’t have any red peppers. Think sundried tomatoes could be subbed?? I might just try it and see what happens! I haven’t tried it, but I can’t see why it wouldn’t work! We’re hard to impress and this was amazing ! Thank you! 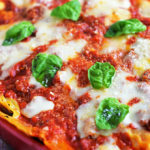 This recipe is awesome im making it right now, and have made it several times before love it thank you for sharing it!!! I made this with gluten free pasta and unsweetened coconut milk instead of the regular milk and it turned out perfectly! I also omitted the parmesan cheese. Just a recommendation for those that cannot have gluten or cow’s milk. Just made it now. Yummy. I used spicy chicken sausage from Whole Foods. Based on some of the recommendations, I used only 4 oz of goat cheese. I am happy I did this. 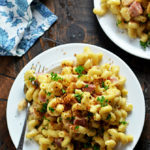 I made this with gluten free pasta and it worked out amazing too! Very happy! Would this feed 5 adults? What kind of goat cheese should I use? I’ve never bought goat cheese before so I don’t really know what to look for; any suggestions on a good brand? Also, any idea how many full red peppers I would need to equal the amount in one 16 oz. jar. I’d really rather roast them myself since jarred ones seem pretty expensive. I made this tonight and it was delicious! I modified though and added 5 oz of feta as opposed to the goat cheese and it still tasted amazing. I’m glad I read the comments as I only have skim milk on hand so I bought 2% which worked very well in the sauce. Holy crap. I am not a frequent blog commenter but I just had to come say WOW to this recipe! I snuck some cherry tomatoes into the red pepper puree (it’s summer!) and our two-person household polished off the whole pot for dinner & lunch the next day. I may or may not have also dug into it cold as a midnight snack. So. Good. Y’all. Oh wow! Just made this and its sooooo good. Lol hubby hasn’t tried it yet but am sure he will love it. Thanks for sharing! Made this Friday night and my boyfriend and I both agreed it was like a grown-up version of hamburger helper. It was delicious though! I only used half the amount of goat cheese and just added a little extra parm- turned out wonderful. Thanks for the recipe! Delicious! It’s rich and creamy, and super tasty with extra ground black pepper. It was easy to make and minimal clean up. Made this twice (according to recipe), delicious both times. I did roast my own red peppers…that’s the only change. Big hit with the family. I made this for lunch today. Man oh man was it scrumptious. I used 6 Oz of the goat cheese after reading some reviews, but using the other 2 Oz wouldn’t have hurt it a bit. My pasta was penne. Sorry for the spelling of that. Will definately make again for sure. I made this exactly as instructed in the recipe and it was absolutely delicious! My husband and I loved it. The goat cheese-parmesan-roasted red pepper combo was awesome. I do have a question: while this dish already has a good amount of veggies in it, could you recommend a vegetable or two that might taste good with this flavor combo? We’ve been trying to get more veggies in our diet. Thank you for an excellent recipe!! One pot meals are amazing! 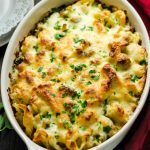 So easy for week night dinners and this one looks unbelievable! Just found this yummy looking recipe on pintrest. 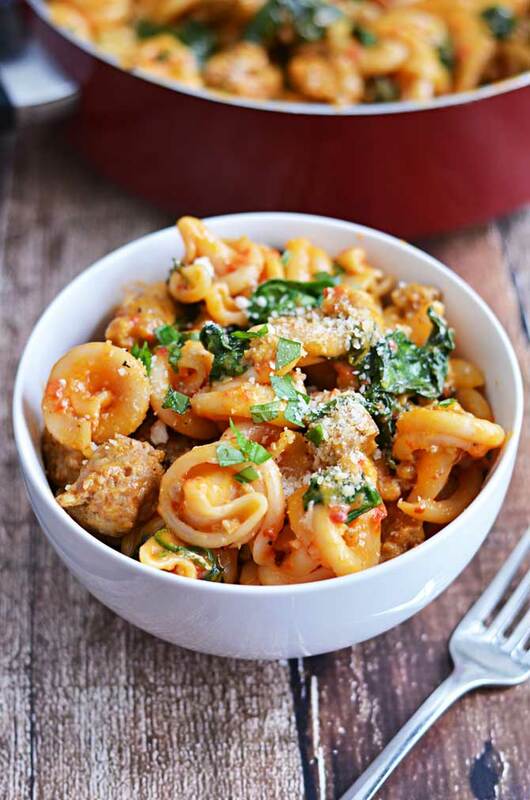 What type of pasta did you use in the picture in pintrest. I usually never have luck with recipes I find on Pinterest but this was a keeper. I used ground dark meat turkey and some dried basil and oregano. Also, used half the goat cheese but still so tasty. Thank you! Followed Nicole and used basil and oregano, along with garlic and onion powders. Added cream cheese instead of goat. Deglazed browned sausage pan with a deep red wine and burned almost all off.